Pali Brunilda and Aertsen Ivo (eds.) (2017). Restoring Justice and Security in Intercultural Europe. Routledge: London. Pali Brunilda (2017). Mapping the cultural turn in (in)security discourses: Highlighting the path for restorative justice. 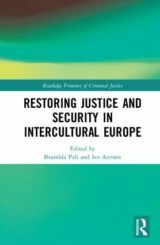 In Restoring Justice and Security in Intercultural Europe, edited by Brunilda Pali and Ivo Aertsen. Routledge: London, pp.23-37. Espen Foss Marius and Pali Brunilda (2017). Restorative justice in societies of control. In Restoring Justice and Security in Intercultural Europe, edited by Brunilda Pali and Ivo Aertsen. Routledge: London, pp. 182-198.